Police broke up a White House rally and briefly detained at least five environmentalists trying to present Prime Minister Vladimir Putin with chunks of trees felled by loggers attempting to clear a Khimki forest north of Moscow for an $8 billion highway to St. Petersburg. About 50 activists came to the White House to present Putin or one of his deputies with pieces of timber from trees felled in the forest near Sheremetyevo Airport. But the rally was dispersed by police officers, who detained five of the activists, including the head of the Left Front group, Sergei Udaltsov, without providing any explanation for the crackdown, the environmentalist web site Ecmo.ru reported. Gazeta.ru said more than 10 people were detained. 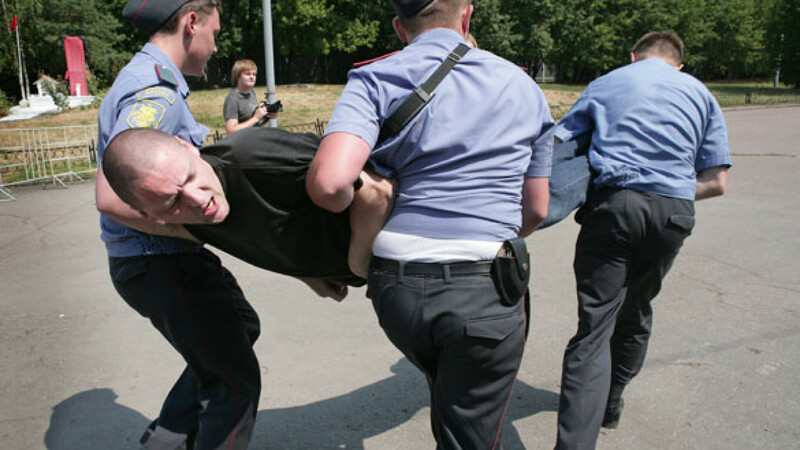 “The police swooped down on us and detained us, acting in a very rude and harsh fashion and turning a peaceful event into a brawl,” Udaltsov said, Gazeta.ru reported. The activists still managed to file a request to meet with government officials, but not Putin or his deputies, Ecmo.ru said. Loggers attempted to start work on the Moscow-St. Petersburg highway last week, leading to clashes with environmentalists, who claim that the developers do not have the necessary paperwork for the project. The activists have set up a camp in the forest to prevent work from resuming. The state company Russian Roads, which is overseeing the deforestation, demanded Thursday that the police remove the activists from the forest and threatened to sue anyone who hindered the logging, Ekho Moskvy radio reported.